Astronomers at Penn State have used the Hubble Space Telescope to find a blistering-hot giant planet outside our solar system where the atmosphere “snows” titanium dioxide — the active ingredient in sunscreen. These Hubble observations are the first detections of this “snow-out” process, called a “cold trap,” on an exoplanet. This discovery, and other observations made by the Penn State team, provide insight into the complexity of weather and atmospheric composition on exoplanets, and may someday be useful for gauging the habitability of Earth-size planets. 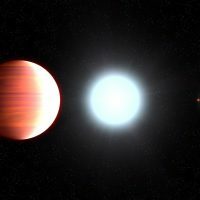 “In many ways, the atmospheric studies we’re doing now on these gaseous ‘hot Jupiter’ kinds of planets are test beds for how we’re going to do atmospheric studies of terrestrial, Earth-like planets,” said Thomas Beatty, assistant research professor of astronomy at Penn State and the lead author of the study. “Understanding more about the atmospheres of these planets and how they work will help us when we study smaller planets that are harder to see and have more complicated features in their atmospheres.” The team’s results are published in the October, 2017 issue of The Astronomical Journal. The Kepler-13 system is 1,730 light-years from Earth. The Hubble Space Telescope is a project of international cooperation between NASA and ESA (European Space Agency). NASA’s Goddard Space Flight Center in Greenbelt, Maryland, manages the telescope. The Space Telescope Science Institute (STScI) in Baltimore conducts Hubble science operations. STScI is operated for NASA by the Association of Universities for Research in Astronomy, Inc., in Washington, D.C.